Ana is a Founder & CEO of Africa GreenCo. Africa GreenCo is developing an innovative new business model to address offtaker creditworthiness and unlock private investment in power projects in Africa via a public-private-partnership between African governments, the private sector and international financial institutions to create a dynamic new participant in the Southern African Power Pool (SAPP). Africa GreenCo will be a regional creditworthy intermediary offtaker and power services provider, reducing the credit risk and therefore cost of renewable energy generation projects. Its initial focus will be on supporting projects in Zambia prior to expanding into other SAPP member countries. Africa GreenCo’s transformative role is to mobilise significant private sector finance for the sector, to increase the liquidity of and reliance on the SAPP markets for risk mitigation and begin to diversify away from the current model of African governments taking on heavy contingent liabilities to secure individual energy projects. Ana believes that only through a PPP entity and development of new business models in partnership with the national utilities and governments can we build a sustainable and more fiscally efficient power sector. Ana is a finalist in the Africa, Outstanding Contribution Award: Power 2018 category as run by the African Utility Week and has achieved numerous international recognitions for her innovative work in the energy systems space in Sub-Saharan Africa. Previously Ana practiced law for more than a decade having qualified in England and Wales and the State of New York. This included working on transactions relating to the exploration, development and operation of traditional oil and gas projects and renewable energy projects in Russia & CIS, the Middle East and across Africa. Ana trained with Allen & Overy LLP and went on to work for Fulbright & Jaworski LLP and Trinity International LLP, advising on a diverse range of projects within the energy sector, predominately in Sub-Saharan Africa. 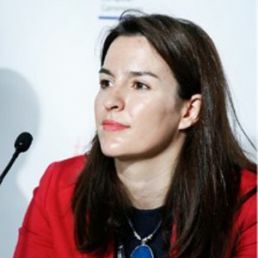 In March 2015, Ana was appointed by the UN as the Team Leader responsible for a Project Team (comprising about 30 specialists) in charge of developing international renewable energy PPP standards as part of the SDG international development agenda. Ana is from Croatia. We need to promote business unusual ideas for global impact. The IMF recently said that low income countries need extra outlays of 14 % of GDP for SDGs. For clean energy in Africa we need to leverage regional power pools to de-risk and de-link from single sovereign fiscal impact. Renewable have the potential to transform the energy sector in Africa whilst providing clean energy to the vast majority of people without power. To do so partnership around new business models between the private and public sector is required - we can’t do today’s job with yesterday’s methods and methods need to be context respectful and specific. We should embrace Nikola Tesla’s moto in life: "The present is theirs; the future, for which I really worked, is mine.” Let’s all work for the future.